Did you know M.A.R.C.H. raids shutter vital cultural spaces with over 300 operations a year? Sign Talks Not Raids Bill #1156. We need transparency on the M.A.R.C.H. program. M.A.R.C.H. 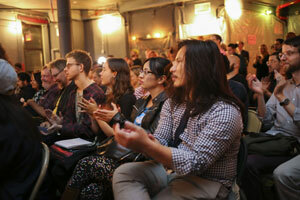 raids shutter vital cultural spaces with over 300 operations a year. Agents in SWAT outfits storm a venue at peak hours. Cause loss of wages and jobs, scare patrons and neighbors, and turn vibrant community spaces into empty storefronts. M.A.R.C.H. operates without oversight. No recourse possible for those targeted unfairly. Click a Council Member to tweet thank you for signing on. Challenge their colleagues to join in at the same time. Call first. Phone calls are much more effective than social media. "Reports from businesses and community leaders about fear-inducing raids are concerning and legislation will help city officials assess a more responsible path forward. I am proud to sponsor this much-needed legislation to shine a light on the M.A.R.C.H. Task Force and bring accountability to the process." Nola Rodney, owner of Hills Restaurant and Bar. Rachel Nelson, Secret Project Robot. "We advocate for safety and preservation of grassroots cultural spaces through building relationships of trust with all stakeholders. Venues and artists most times have great relationships with their local officers at the precinct level, but when the MARCH task force appears--with what is effectively a scary raid--it wreaks havoc on valuable and vulnerable community spaces. We need talks not raids." 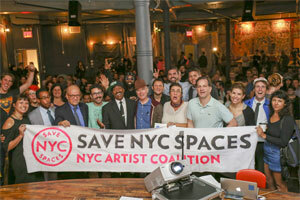 Olympia Kazi, NYC Artist Coalition.